Capnography for mechanically ventilated and spontaneously breathing patients. Full-featured capnography previously available only in much larger monitors. For use on intubated and non-intubated patients. The low sample flow rate of 50 mil/min allows monitoring of the widest range of patients, from neonates to adults. Patented Microstream technology and versatile range of FilterLine accessories enable CO2 monitoring even in challenging high-humidity environments. Innovative optical bench enhances stable, accurate measurements from a small sample. Capnographic waveforms and trends. 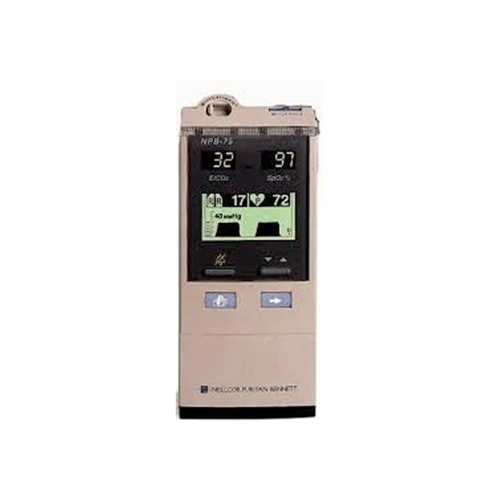 Pulse Oximetry NPB-75 Trusted Nellcor pulse oximetry technology. 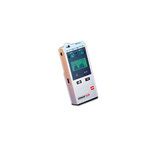 Compatible with a complete line of Nellcor adhesive and reusable sensors. Graphical trends and plethysmographic waveform. For mechanically ventilated and spontaneously breathing patients. Full-featured capnography previously available only in much larger monitors. For use on intubated and nonintubated patients. Low sample flow rate of 50 mil/min allows monitoring on the widest range of patients, from neonates to adults. Patented Microstream™ technology and versatile range of FilterLine accessories enable CO2 monitoring even in challenging high-humidity environments. Innovative optical bench enhances stable, accurate measurements from a small sample. 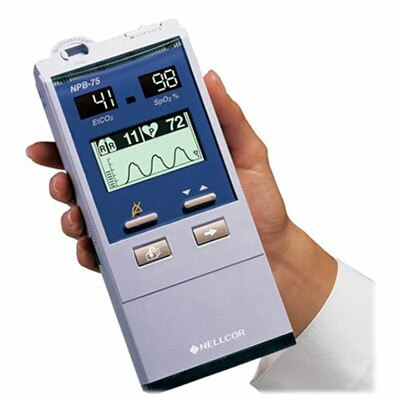 Trusted Nellcor pulse oximetry technology. Compatible with complete line of Nellcor adhesive and reusable sensors. Graphical trends and plethysmographic waveform. AC Input: 100 - 230 VAC, 50/60 Hz, 25 - 39 VA. Battery Life (typical): 4 - 7 hrs, Recharge in approximately 4.5 Hrs. Operating Temperature: +41°F to +104°F (+5°C to +40°C). Operating Altitude: -1,254 to 9,882 ft (-382 to 3,012 m). Display SpO2 range: 0% - 100%. Display Pulse rate range: 20 - 250 bpm (low perfusion: 20 - 250 ± 3 digits). Accuracy (%SpO2 ± 1 SD): Adult 70% - 100% ± 2 SD (with D-25 Sensor); Neonate 70% - 100% ± 3 SD (with N-25 Sensor).